Perfect Lover is a three-minute film of a realistically animated crow who sounds off the hours of the day in neat procession. The crow speaks in a human voice – ‘One o’clock, two o’clock, three o’clock’ – while perched atop trees and stones next to a river; the hours cycle round and, when the crow strikes midnight, he announces the new day. We begin the film on March 11 and finish on the eve of March 15. And then the film loops. Perfect Lover is an elaboration of Wolfson’s unnamed piece at the 2006 Whitney Biennial in which speakers on the museum’s roof broadcasted a crow’s call, which has the strange magic to repel every sort of bird except crows – that is, its siren song aimed to incite a murder of crows to descend on the museum. In an interview, Wolfson claimed that the unnamed crow work is ‘not about birds flying around the top of the Whitney; it’s about us, the piece is a mirror.’ To extend that point, Perfect Lover swaps the shrill caw for a man’s voice, effectively inserting a more easily identifiable element with which to lure the humans. 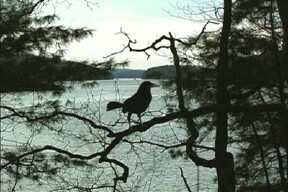 Next to the skull and crossbones, the crow is just about the closest thing to a universal symbol. Towards the end of the film, the little crow coughs in between counts, and when he reaches March 15 – the Ides – the film blacks out. Surely at this point all signs point to an ominous end. But which end? Oh, there are so many ends these days. Pick your crisis: the environment, the art market, civilization, or perhaps your general run-of-the-mill existential malaise. And yet Perfect Lover elicits laughter, the talking bird an absurd gag. The crow is undeniably cute and if he really is the spokesman for the end days we couldn’t ask for a friendlier one. Like some Disney animatronic, Wolfson’s crow is both the embodiment and summary of a densely meaningful situation. In cartoonishly condensed form, the crow is irony and cynicism, crop conceptualism, and the apathy that follows worry when you know your time has run out – that is, when everything you wanted to say has already been expressed by a branded icon. The New York Times recently reported on the ‘Yellow Tail phenomenon’, a marketing success story in which a certain animal on a wine label proved to sell more cases of wine than non-animal endorsed wines. Now, a trip to the wine store reveals a menagerie. Straight out of John Baldessari’s Tips for Artists Who Want to Sell (1967-68), the Cabernet kangaroo and the ticking crow are not only mascots for loneliness, they also make good company. Whether the crow carries the weight like a gift into the sky, or waits in the wing to profit from our demise, well, that’s just for him to decide.